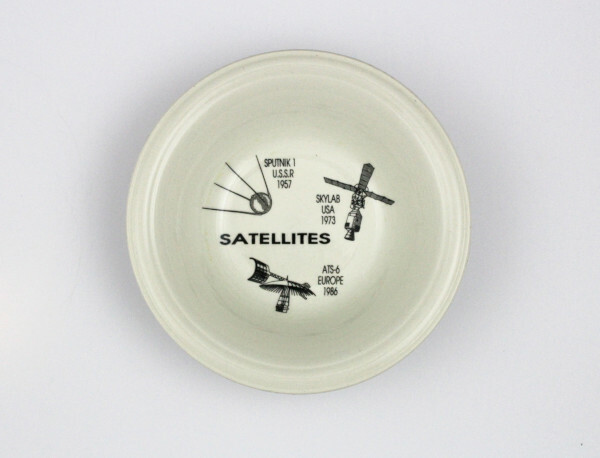 Produced by John Tams Ltd in Stoke-on-Trent, England, this ceramic bowl depicts the Soviet satellite Sputnik 1, the US space station Skylab and the ATS-6 satellite. The bowl is rather enigmatic, for several reasons. Firstly, the bowl carries no date stamp so it is difficult to determine exactly when it was made. Secondly, the date associated with the launch of ATS-6 is incorrect, whilst the image of Skylab does not match the actual configuration that flew. The first possible answer for these anomalies is that the bowl was produced before 1973 (the date Skylab was launched). This could account for the incorrect image used for an as yet unlaunched Skylab, as well as the incorrect launch date for ATS-6 – as the satellite would not be launched until 1974. This reasoning is brought into question by the stamp on the underside of the bowl however. The ‘Microwave Oven & Dishwasher Safe’ mark was something that pottery companies only began doing in the late 1970s and became more prevalent by the mid 1980s. 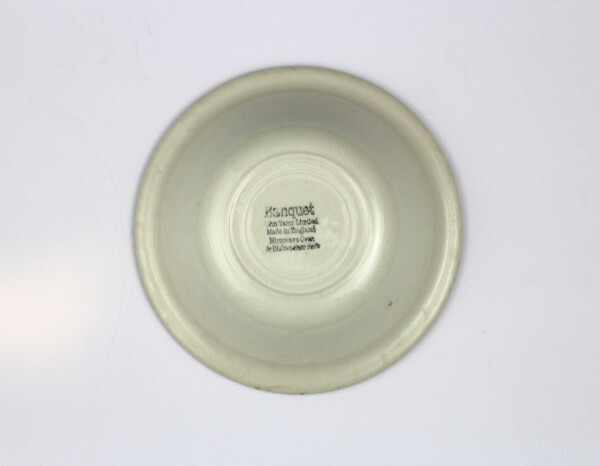 Therefore it is unlikely to have been made before 1973, and as the John Tams Ltd backstamp stopped being used when the company became a PLC in 1988, it is sensible to conclude the bowl was made sometime between the mid 1980s and 1988. This conclusion means that when it was produced Sputnik, Skylab, and ATS-6 had all been launched and had finished their periods of active service – calling into question why the company got the date wrong and why they chose these three satellites. As John Tams Ltd has gone out of business, we may never get an answer. Simply put this commemorative bowl has several factual mistakes on it, and remains an enigmatic and mysterious object.